The 150th anniversary of Italy’s unification is approaching quickly and the celebratory events throughout the United States are plentiful. Among the events organized under the auspices of the President of the Republic of Italy is the show The Heirs of Canaletto: Fabio Mauroner and Emanuele Brugnoli in Venice, 1905-1940. The exhibit, wanted by the Embassy of Italy and the Italian Cultural Institute, opens to the public on March 10 at the Embassy of Italy in Washington and will remain on display until April 18. The show takes place in conjunction with the ongoing exhibition Canaletto and His Rivals at the National Gallery of Art (February 20 through May 30) and is also part of La Dolce DC, the citywide celebration of Italian culture. The thirty-five prints by Fabio Mauroner (Udine, 1884-Venice, 1948) and Emanuele Brugnoli (Bologna, 1859-Venice, 1944), which depict the city of Venice, come from private collectors and reinforce the idea that Venetian view painting tradition has been long and prolific. The first great Venetian vedutista was Luca Carlevarijs in the 17th century (Udine, 1663-1730 Venice), who realized the importance of immortalizing the grandeur of the lagoon city on canvas. The apogee of vedutismo, however, comes in the following century with Giovanni Antonio Canal, better knows as Canaletto. However both Mauroner and Brugnoli, who were not of Venetian birth but moved there and devoted most of their careers to celebrate La Serenissima, confirm the endurance of the Venetian view painting tradition. Fabio Mauroner was born in Udine in 1884 and moved to Venice in 1905. He depicted the religious feasts, the regattas, but also the Venice he had come to know as a resident, the calles, the back alleys, the hidden courtyards that foreigners often overlooked. Mauroner first encountered etching in an exhibition of the Irishman Edward M. Synge in Rome in 1904. Subsequently, Mauroner shared a studio with Amedeo Modigliani in Venice, where he also studied printmaking with Synge. Over the next thirty years, Mauroner executed approximately one hundred and thirty prints before retiring from etching to become a scholar of Venetian Renaissance and Baroque art. Mauroner was aware of the great eighteenth-century tradition of Venetian vedute, seen in the works of Canaletto, Guardi, Marieschi and others. Some of Mauroner’s prints represent a continuation of their approach, depicting major monuments of Venetian history, including views of Piazza San Marco, the Piazzetta, the Ducal Palace and the magnificent facades along the Grand Canal. Other prints are closer to the approach of James McNeill Whistler and Ernest David Roth, capturing characteristic aspects of more intimate and typical Venetian cityscapes. In contrast, however, Fabio Mauroner also chose to represent events and activities that were quintessentially Venetian, including benedictions in the Basilica of San Marco, shopping in the Rialto, regattas on the Grand Canal, and religious processions over the votive bridges annually erected on important feast days. One of Mauroner’s close friends in Venice was Emanuele Brugnoli, an instructor at the Academy of Fine Arts in Venice, and the founder of its school of etching. Brugnoli was born in Bologna in 1859, moved to Venice in 1880, and began teaching at the Academy in 1912. Brugnoli was similar to Mauroner in representing the experience of Venetian life in his era, but he offered a more panoramic view of the energy of the populace in the squares and on the canals. 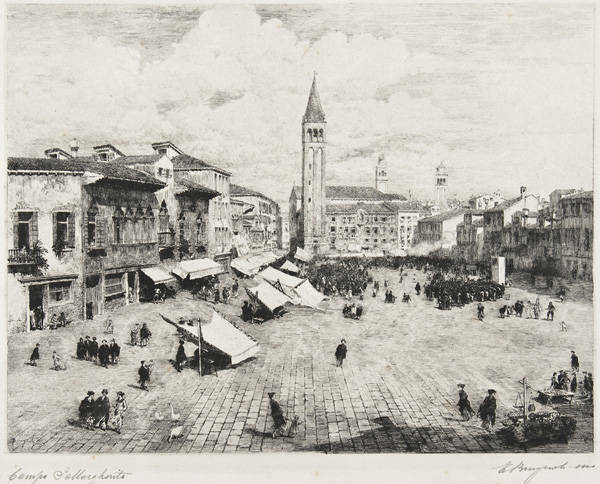 His large scale images, Campo Santa Margherita (1920) and Campo Santa Maria Formosa teem with the everyday activities of working class Venetians. 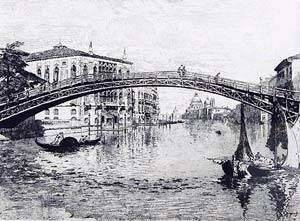 Mauroner and Brugnoli differed from foreign artists, such as the distinguished American expatriate etchers Whistler, Roth, and John Taylor Arms who visited the city to record Venice as a series of picturesque views but were indifferent to the day-to-day lives of the Venetians. 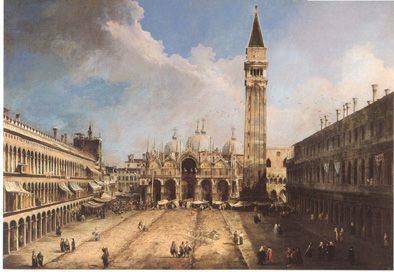 In Mauroner and Brugnoli’s work, images of the working class squares of Campo Santa Margarita, Campo San Giacomo dell’Orio, and Campo San Giovanni in Bragora spring to life as outposts of Venetian daily experience, whether at the fish and flea markets or the puppet shows during Carnevale. Today Mauroner and Brugnoli are well known in Italy but not in America, however their production displays a dedication to craft equal to that of their better known foreign counterparts while representing a uniquely local approach to Venetian imagery. This exhibition is a unique opportunity for the American public to see their work. This is the first show devoted to Mauroner in the United States in over seventy years, and the first to include the works of Brugnoli in Washington. 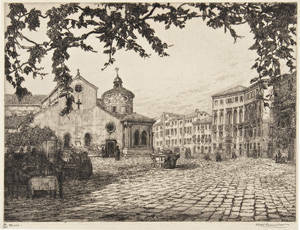 The show, organized by the Embassy of Italy and the Italian Cultural Institute was also made possible by the Dickinson College (Carlisle, Pennsylvania), which allowed the etchings by Fabio Mauroner and Emanuele Brugnoli to be exhibited at the Embassy of Italy. Curator of the exhibit, and author of the brochure, is Dr. Eric Denker. Tom Whitmore and Franco and Maria Ferrari collaborated on the research efforts. To view this exhibition, which is by appointment only, please email [email protected].